[b]Forest Friends Ireland[/b] was founded in May 2000, by [b]John Haughton[/b], [b]William Maher[/b] and [b]Stephen Coyne[/b], who were extremely frustrated by the failure of all those involved with forests in Ireland to provide an alternative to a rampant monoculture forestry policy. Both the public agencies and a small number of the Environmental Non Governmental Organisations must shoulder the blame for this continued debacle. FFI are at pains to show that it has already been demonstrated by best practice that the arguments against the economic viability of broadleaves are now largely invalid, with short, medium and long-term profit possible with native hardwood species mix. [b]John Haughton[/b] is a Town Planner and Social Scientist, who worked for many years as a Senior Esecutive Planner in Dublin Corporation, specialising in '[i]Community Planning[/i]', '[i]Ecologically[/i]' based, with strong emphasis on the environmental heritage. His work has concentrated on marginalised communities in Dublin City. The first of these was the '[b]Finglas Enlivenment Project[/b]'. This project recieved the Irish Planning Institute's '[b]Planning Achievement Award[/b]'. It was promoted as representing best practice by the European Union and the Organisation for Economic Cooperation and Debelopment, and by an official report carried out on behalf of the City of Copenhagen, Denmark. The [b]Ballyfermot Renewal Project[/b] followed closely the model of the '[b]Finglas Enlivenment Project[/b]', with similar results. John set up the first [b]Irish Community Tree Nursery[/b], namely, '[b]The Finglas Community Tree Nursery[/b]', in 1990. John has played a lead role in many of the projects outlined in our web site. He promotes environmental awareness in his weekly hour-long radio programme, '[b]Enviro[/b]' which goes out on the Dublin Community Radio Station [b]NEAR FM 101.6[/b] (North-East Access Radio). 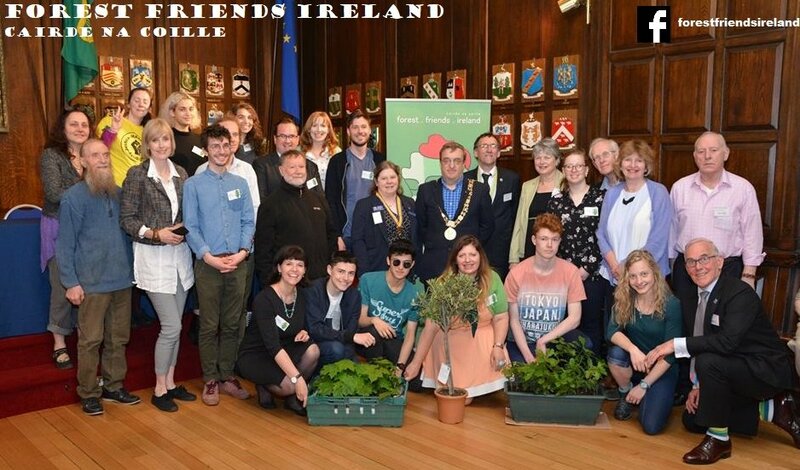 [b]Stephen Coyne[/b] has, for many years, been a [b]community activist[/b], working with local communities and has been involved with many campaigns, both local and national, to create a better environment. He has also been involved in community employment and horticultural projects and work. He has completed community development studies at the [b]National University of Maynooth[/b], Co. Kildare, Ireland. Stephen has a special interest in promoting community development and the improvement of public paricipation in decision-making processes. [b]William Maher[/b] has a degree in [b]Environmental Management[/b] from the Open University. He has, and still does, play a key role in the management of [b]Forest Friends Ireland[/b]. He is particularly interested in the [b]economics of forestry[/b] and the [b]economies of nature[/b]. William has also studied important forests in Europe and in Latin America, including Poland and Bolivia.